My guess is that over 90% of the 1920 - 21 Postmaster Provisionals - the "pyb" and "p" handstamped locally on Imperial Arms kopeck value stamps - were used on Money Transfer Forms and Parcel Cards, especially the latter. Red Army soldiers at this time were sending home very big parcels of Loot from areas recently taken by the Red Armies and lots of stamps were needed on the parcel cards. A 20 kopeck stamp overprinted "pyb" had twice the value of the highest value Imperial stamp, the 10 rouble. And for part of the period, ordinary letters and postcards were carried Free for civilians and soldiers alike. 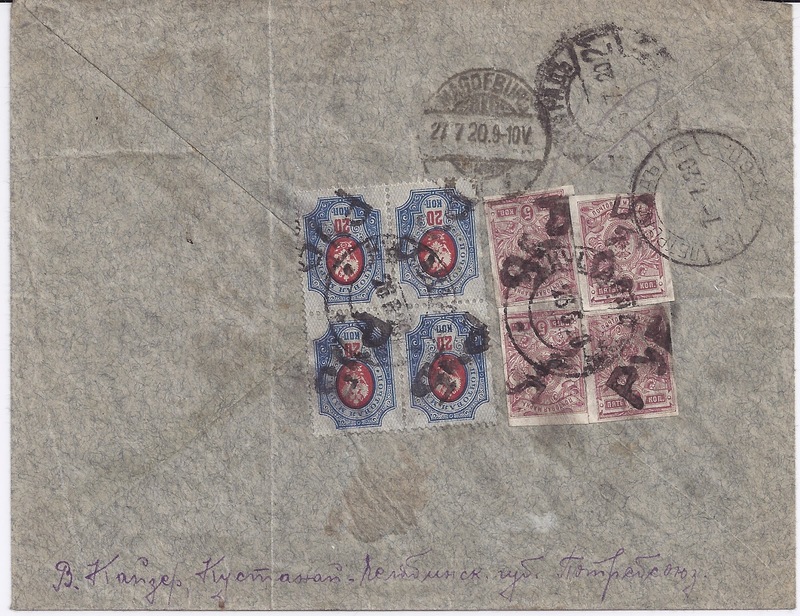 This letter was posted at Kustanai on 26 6 20, the first week in which mail services to foreign countries resumed. It transited through Petgrograd on 6th and 7th July, with no obvious signs of censorship, and arrived in Magdeburg on 27 July 1920 - so just a month in transit. 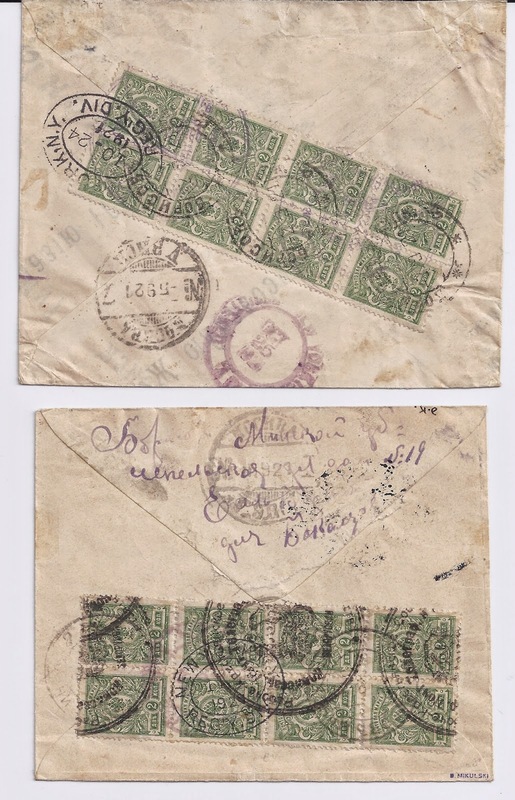 Usefully, the MAGDEBURG cancel ties both groups of stamps to the cover. The only puzzle is the franking. The Tariff of 6th June 1920 priced a Registered letter going abroad at 10 roubles. But here we have a 100 rouble franking, far too much to be accounted for by weight steps. One obvious possibility is that Red Army Kustanai was working on a local currency or Tariff which converted the 10 roubles of the National tariff to 100 roubles locally. There is nothing about the cover, which appears to be from husband to wife, to suggest that it is philatelic. More Postmaster Provisional overprints were made in 1921, the better known ones include those of Minsk. 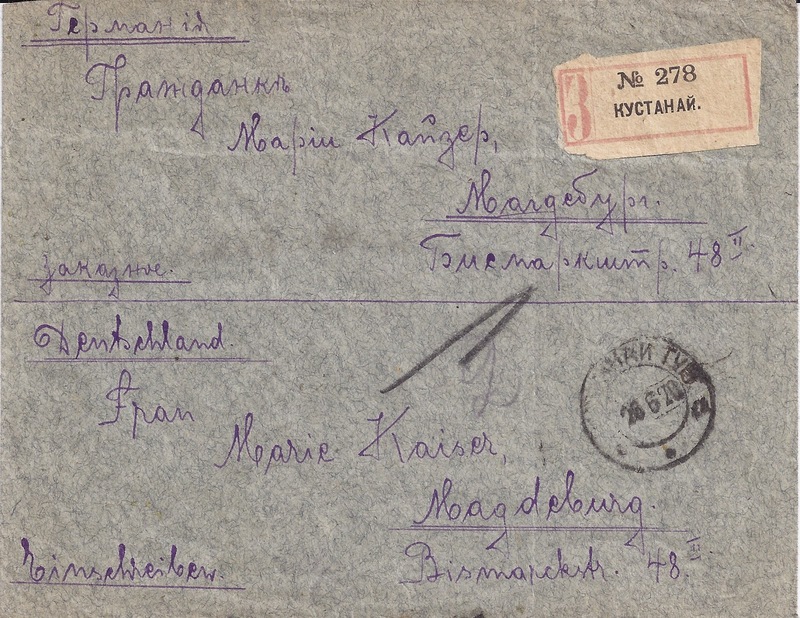 The following two covers sent from BORISOV MINSK in September 1921 and addressed in different handwritings to the Jewish Daily Forward, a widely-read socialist newspaper published in Yiddish in New York, are both franked with 8 x 2 kopeck stamps revalued by the large Minsk seal applied (normally) over blocks of 4 and converting each stamp to a 250 rouble stamp. They are thus franked at 2000 roubles which is correct for registered letters abroad by the National Tariff of 25 August 1921. But one cover, sent on 2 September, has stamps revalued with a seal in violet ink. The second, posted on 12 September has stamps showing a black seal. 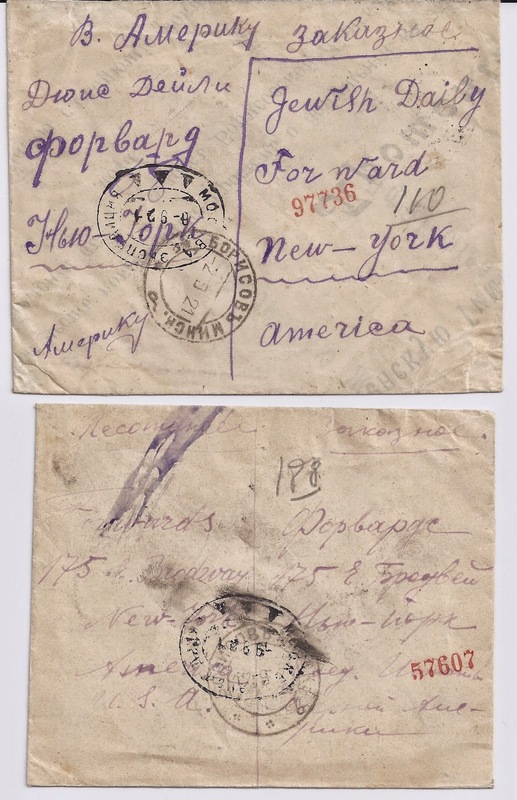 Both covers transited through Moscow and picked up a Three Triangle Censor cachet there, and both covers have New York Registry Division receivers which helpfully are over the stamps.